It's Transformers vs. G.I. Joe! Contains 4 randomly selected mini-figures. 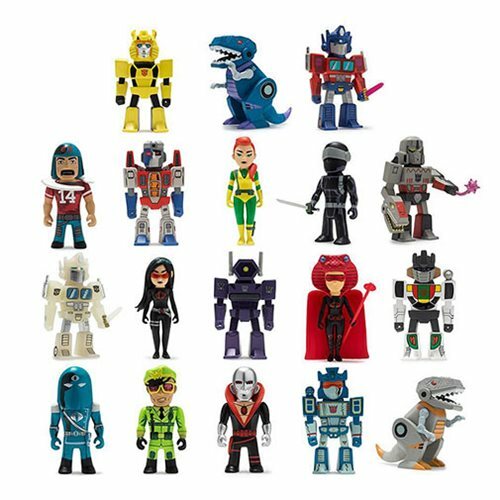 Based on the critically acclaimed maxiseries comic by John Barber and Tom Scioli, Kidrobot and Hasbro have teamed up to bring two of the world's most recognizable franchises to life with the Transformers vs. G.I. Joe capsule. Stylized as an homage to Jack Kirby and the Silver Age of Comic Books, this series mashes up earth's favorite action heroes and those futuristic aliens that are more than meets the eye. Get ready to jump down the rabbit hole, and strap in for a wild sci-fi ride. Collect them all today, and get ready for a battle for the ages! Ages 15 and up.